Buddy MacMaster died at his home in rural western Cape Breton in Nova Scotia around 9 p.m. Wednesday, 20th August 2014, at the age of 89. He was born into a Gaelic-speaking home in Timmins, Ontario to John Duncan MacMaster and Sarah Agnes MacDonald MacMaster. The family was originally from Cape Breton Island in Nova Scotia, and in 1928 they returned to Cape Breton to settle in the town of Judique. MacMaster's father played the fiddle, but his mother sang to him from birth, lilting with a Gaelic inflection peculiar to the area, and it is she that he credits for instilling in him a love of music. At an early age, MacMaster began to play the fiddle. At age 12, he had his first public performance at an amateur hour in Port Hood, Nova Scotia, and at age 14 he played his first professional gig at a square dance in the nearby town of Troy. Although he continued to play nights at square dances across Nova Scotia, MacMaster began a career as a station agent and telegrapher for the Canadian National Railway to support himself and his family. In 1943, he made his first radio broadcast from the town of Antigonish, Nova Scotia in 1948. In the 1970s, he played regularly on Canadian television; CBC Television's Ceilidh show. After his retirement from the railroad in 1988, he went on to play full-time as a professional musician, gaining an international reputation. 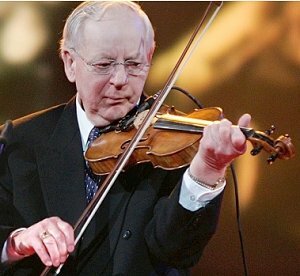 He was one of the first Cape Breton fiddlers to be asked to teach in Scotland.